Starting next year, farmers will get loans without requirement of collateral at low interest rate from various financial institutions in the country. The central bank-Royal Monetary Authority (RMA) has come up with new loan policy called ‘Priority Sector Lending’ where farmers can avail themselves of loan at maximum of eight per cent interest rate to operate livestock and agricultural projects. Youth are also eligible to get such loans. 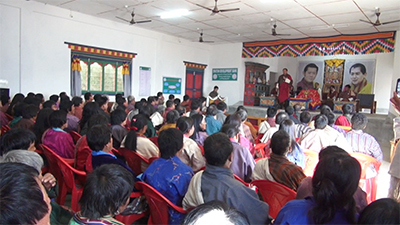 The Governor of RMA, Dasho Penjore, said the policy will act as a stimulus for economic transformation, and targeting critical sectors under cottage and small industries to become more business oriented. “This policy ensures equal financial access to farmers and youth and without mortgage and guarantors, they have to insure which will act as collateral,” added Dasho Penjore. RMA will launch the Priority Sector Lending Policy next month. Under the policy, the central bank also has plans to recommend financial institutions to grant loans of Nu 1.5 bn for both agriculture and non-agriculture cottage and small industries in the country. Currently, Bhutan Development Bank Limited and Rural Enterprise Development Corporation Limited are the two key banks that provide loans to farmers.